Grooming is an important part of caring for your dog so he can look and feel his best. A visit to the groomer’s includes more than just a good bath. 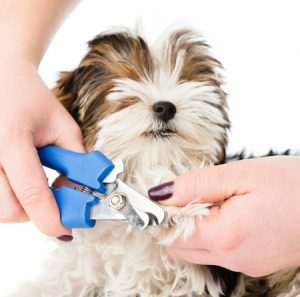 The groomer can also clip your dog’s nails, exfoliate his skin, brush his teeth and trim or shave his hair. If you groom your dog regularly at home, she won’t be as nervous when she gets to the groomer’s for the first time. Make sure to brush and bathe your dog, followed by a treat. Touch your dog in all the areas a groomer would: head, belly, paws, etc. Don’t view it as a chore—it’s an important bonding opportunity. A visit to the groomer’s shouldn’t be the first time you drop off your dog in someone else’s care. Try dropping him off for an hour or two at a friend’s or with a sitter, so he won’t be so nervous when you take him to be groomed. Give him a pat on the head and say “see you later” with confidence. If you’re nervous, your dog will pick up on it. Reward your dog for a grooming visit by giving her a small treat in the waiting room and possibly taking her to the dog park afterwards. Pauley’s Pups is more than just a source for friendly, adorable puppies and toy breeds. Did you know that we also offer full grooming services through Heavenly Clips in Ashland, Virginia? Contact us at 804-798-7877 to learn more and schedule a grooming appointment.